I don’t need to tell you why you have to eat your vegetables. Okay, maybe I do. Your mother probably told you they provide vitamins, which your body can not produce so you need to get them from food. But back in the day we didn’t know about the recently discovered antioxidants and phytonutrients found in fruits and vegetables, with each different color providing its own specific anti-aging and protective nutrients. And the more intense their color, the more benefits. Many of these phytonutrients (with names I can’t pronounce) cannot be found in any other food groups. Bottom line: Vegetables can help prevent certain diseases like cancer, diabetes, heart disease, and stroke. Vegetables are also some of the richest sources of fiber that exist. So if you want to look great and feel great with a strong immune system, do what I do and eat vegetables every single day. I have a salad with every meal and then one or two cooked vegetables as well. Roasting is my favorite way to cook vegetables. 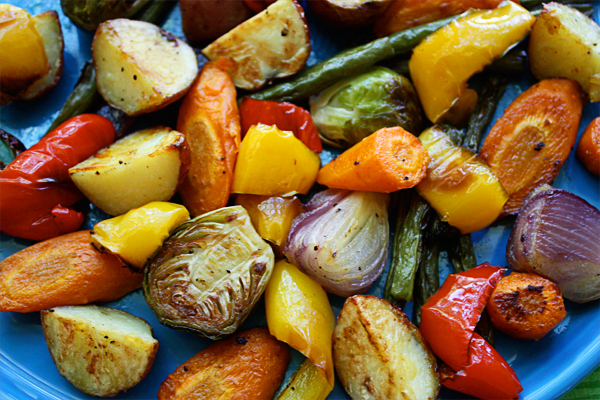 Roasting brings out the natural sugars in vegetables and it’s the easiest way I know to cook them and to eat more than one color at a time. One Comment on "Roasted Vegetables"